I bought a sack of Louisiana-grown sweet potatoes a couple of weeks ago, and now need to find many ways to cook them. Fortunately, sweet potatoes are versatile, lending their use to a wide variety of recipes from desserts to side dishes and even biscuits (the subject of a future post). They are relatively bland and can be combined with many seasonings–I even found a recipe for curried shrimp-sweet potato soup which sounded interesting. 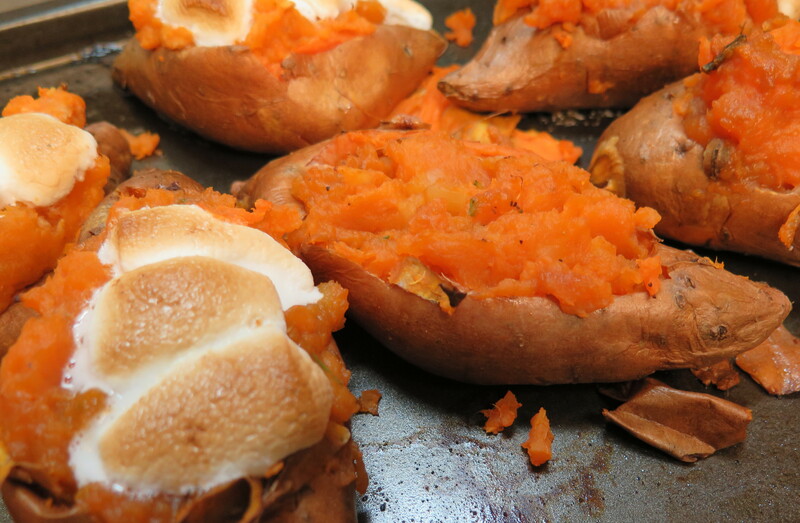 My favorite way to prepare sweet potatoes is simply to bake them. It’s easy, fool-proof and tasty. Given the wide range of flavors that go along with sweet potatoes, I also like to stuff the baked sweet potatoes with an assortment of ingredients. The possibilities are endless.